How do you start your day? Mornings in our home begin with bleary-eyed kids stumbling about in the kitchen, searching for something to eat for breakfast. Now, breakfast with my kids can take on many different shapes and forms. Not always for the better. Guiding my family towards healthier breakfast options is a daily challenge. 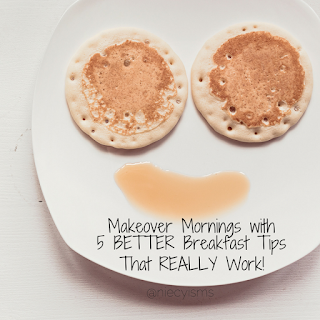 Barbara’s, maker of wholesome snacks and cereals has partnered with Frances Largeman-Roth RDN, nutritional expert, mom of 3, and best-selling author of Eating in Color to share an educational guest post, featuring five better breakfast tips that really work! Thank you to the promotional team from Barbara's Bakery for the courtesy of providing guest post contributor content and product for editorial content purposes. During the month of September, National Better Breakfast Month, we made an effort as a family to include better breakfast choices into our day. Barbara’s recently conducted a national survey, revealing that 95% of parents say their children eat cereal for breakfast on school days, and one in five children go without breakfast at least once per week. Frances Largeman-Roth RDN, nutritional expert, contributes an educational guest post offering parents these 5 better breakfast tips. 1 - Breakfast Time Over Screen Time – Mornings are hectic, especially at the beginning of the school year, before everyone has settled into their schedules. Make it clear to your kids that breakfast time needs to come before they turn on the TV or play with their phone. 2 - Better Breakfasts – Barbara’s Breakfast Survey revealed that juice and cereal are the most common breakfast foods on school days: 71% of children drink fruit juice and 95% of children eat cereal. Clearly, kids love juice and cereal but you can still help them make better choices. 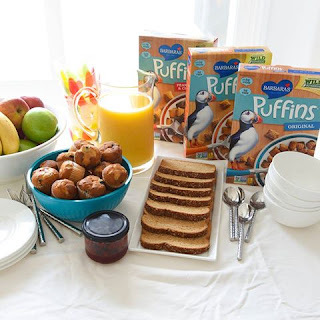 For example, 100% fruit juice rather than “drinks” or “blends” and lower sugar cereals like Barbara’s Puffins, which are also packed with whole grains. 3 - Add Color! – Studies show that kids like food that’s colorful, so take the opportunity to fit in an extra serving of antioxidant and vitamin C-rich fruit--and tempt their taste buds--by offering brightly colored berries, diced apple and melon, or sliced grapes and kiwi fruit on the breakfast table. 4 - Streamline Set Up – Having a sit-down breakfast is much more doable if you do a little prep in advance. Set up the breakfast table the night before: Clear clutter, and set out bowls, spoons, and napkins. Then all you need to do in the morning is serve the food! 5 - Always Have Backup! – There are some days when you just have to grab and go! Being prepared with a healthy back up option is smart. I like to make extra whole grain pancakes on the weekend and freeze them for a rainy day. Visit Barbara's for more great nutritional products and info.